1 G 3 3rd fretfr. 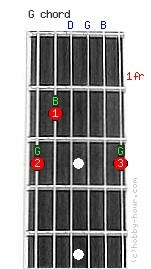 Chord G notes: G, B, D, G, B and G.
The strings 4(D), 3(G) and 2(B) are left open. G major chord's alternative names: GM, Gmaj, Sol major, G dur.